The journey that Alec and I shared with That Repair Shop was one of the seasons that saw these attributes come in handy. We embarked on this journey with the same wide-eyed optimism that we had for all of our projects, and thought that we would enjoy the overflowing fruits of our labour within a year or two. We had a flow that really worked in our life. Alec had set some personal goals with his health and with our budget that saw him take up bike riding, while I was busy keeping up with the demands of my very young teaching career. We rushed the kids to the bus stop by 8am and then, with a skip in our step, we would each skip down the pathway of our shared plan. Alec would ride his bike to That Repair Shop and felt like the King of the World, and I bundled my books and folders into the car to get to my dream primary school job on time. Life was grand. By the end of the first year Alec had built That Repair Shop to a steady flow of customers and had employed a technician and a receptionist to add to the vacuum cleaner repairs he offered himself. He was struggling with cash flow and would certainly have liked some relief from the pile of invoices that our start up business had generated but couldn’t pay for. With the positive outlook of a man driven by one-eyed passion, Alec decided to employ a second technician, thinking that this would enlarge the capacity of the business to generate income. After the second year That Repair Shop continued to err on the wrong side of the cashflow balance. Alec’s plan of attracting additional business had worked, but the expense of expert technical staff and equipment was not adequately met by the extra income. We had a few ‘Where To From Here’ discussions along the way, but my gentle reminders to Alec about his commitment to finish up if we weren’t breaking even after the first year fell on the deaf ears of a man who “Just needed a little more time.” He could see the potential of the business and he could almost taste that juicy, juicy squeeze of cash that he had fixed so firmly in his mind. Above all else, Alec wanted to succeed at his dream. At the end of the day, I understood that. I mean, really, don’t we all? My empathy and trust that he was doing his best here kept me chipping away with Perseverance, waiting with Patience, and riding on the back of his Persistence. He wanted to stretch further into a third year of trying to catch up. This saw him employing a cheap trainee to help push cash flow further into the right direction. It also saw him leave the employ of his own business, opting instead to take up a management position in the computer section of our local Harvey Norman store. He wanted That Repair Shop to work so much that he was willing to admit that his contributions there as a vacuum technician were not as financially rewarding as the wage and commission he could earn by putting his sales flair to good use. He appointed the head technician as the manager of That Repair Shop, and by taking on Saturday work at Harvey Norman, he was able to check in with That Repair Shop on Tuesdays. I can’t emphasise enough how hectic this season was. We were both stretched tight, and it often felt like we would snap. The list of activities that our goals required was so long that it felt like we would never get to the end of it. Alec worked full time at Harvey Norman, and spent every spare minute taking care of That Repair Shop, all the while trying to continue to build his Nelson Vacuums eBay store. 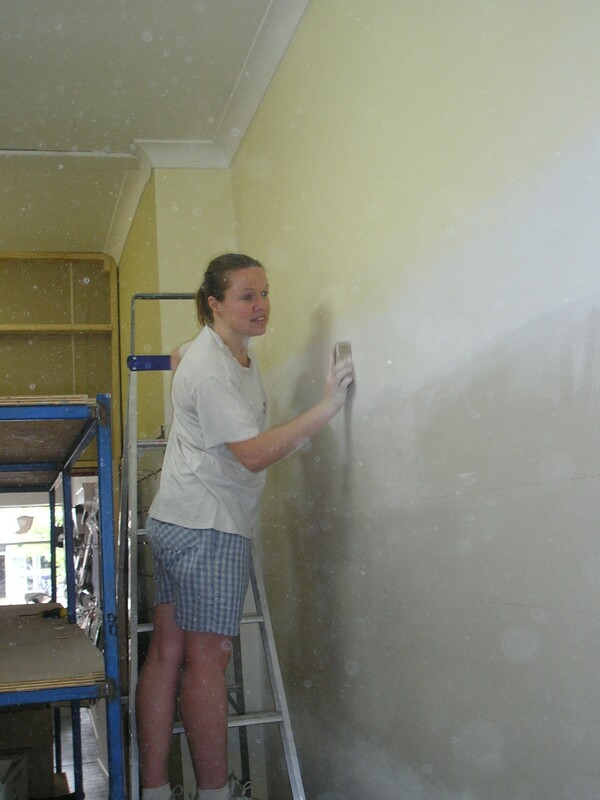 I worked as a full time teacher, and I was heavily involved in my local church with singing and other leadership roles. I too gave every spare moment to helping Alec with the online parts of our business. Of course, all of this work was done from the foundation of our family. Netball matches, and music lessons, and grocery shopping, and doctors visits, and birthday parties, and house cleaning, and play dates were all somehow squeezed in around everything else in a knotted up mess that often looked more like an entanglement of shoelaces than a successful, rewarding life. By the end of the third year, we were exactly as you would have expected: Spent! The work had driven us both to the brink of collapse in every way. We were exhausted with not much to show for our efforts. We were still in love, but we little left for loving the life that we had created. Unfortunately, reality can be crude. One of the most crippling burdens we had created was not in our relationships, but in our finances. Working for three years at a business that cost more than it made had seen Alec robbing Peter more than he could pay Paul, and in the end all of these creditors were lined up at our door with their hand out. We sought advice from our accountant who gravely suggested that bankruptcy was a realistic option. We took the papers home and they sat on the desk for a few days. Alec was too devastated to even look at them. Both of us were too stunned to talk. We had waited ourselves into a corner by blindly expecting the business to save itself, and now, we were going to have to wait ourselves out. While some tough decisions were urgent at this point, no one choice could make all of this go away. We were going to have to drill down into deeper wells of Persistence, Patience and Perseverance if we were going to make the next choices stick. As I get older and more comfy in my own skin, I find new ways of demonstrating the starry-eyed openness I have to the world around me. I have spent years honing the deepest parts of myself, and I have learned how to experience heart-felt joy even amidst gruelling seasons of challenge. I draw an endless well of happiness from the goodness that I see in life, and love nothing more than to join in with activities that release free-flowing joy into the world. I choose to find positivity in all things. I am particularly fond of being cheeky. There is a special delight that comes from pushing social boundaries in a way that splashes some sparkle on an otherwise ordinary moment. To be clear, I am the person who goes out of my way to avoid confrontation and to prevent hurt, but I must confess a personal preference for impish play. 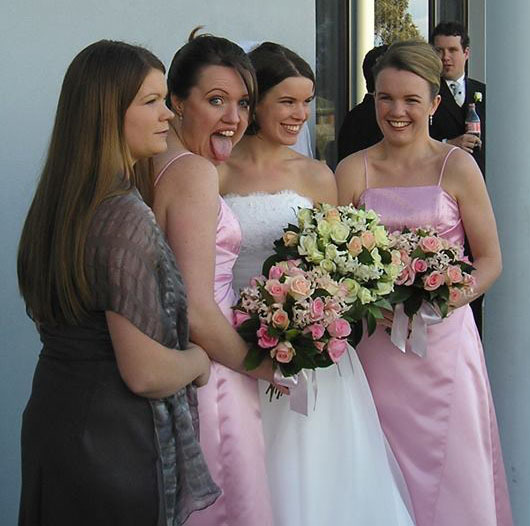 This photo was taken at my sister’s wedding, where I had the honour of being the head bridesmaid. 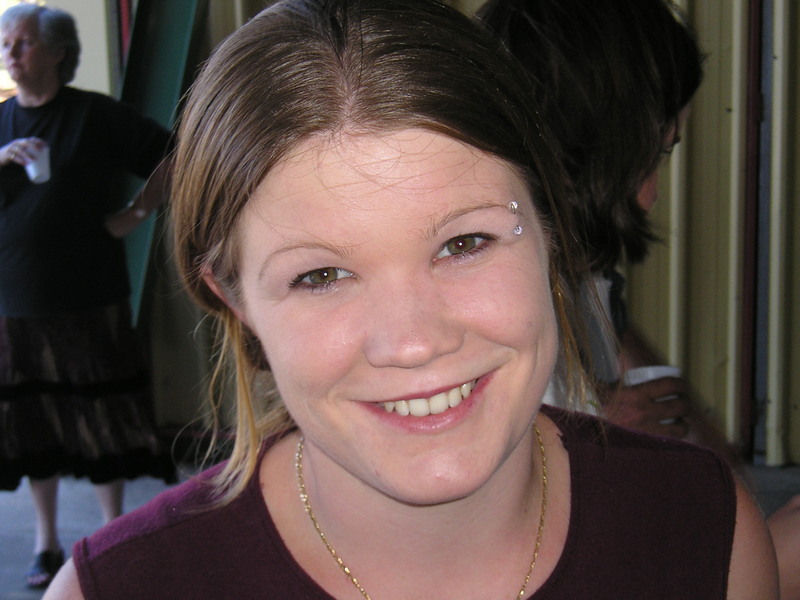 This was a wonderful day in Wodonga, September 2004. I remember it as being jam packed with love as we all gulped back tears watching my sister marry the man of her dreams. I was so truly happy for them, and thrilled to have been invited to help in such special way. Sharing important moments with people I love is a huge priority to me. Unfortunately though, the wedding date was supremely inconvenient because I was scheduled to be away on a teaching placement in Bega NSW. The shortest route from there back to Wodonga was 411km and would take five and a half hours, at best. However, the Snowy Mountains lived up to their name, sending late snow which made this ‘best’ case scenario irrelevant. The journey ended up being a long and scary one that put my priorities to the test. I started out on the Friday afternoon straight after school, expecting that my long drive would be rewarded by a late dinner with my family in Wodonga that evening. I was driving a car that we had only bought a couple of weeks prior, which was wonderful, except for the fact that I wasn’t completely familiar with the way it handled. On setting out, I noticed grey clouds overhead but didn’t think too much of it. After about an hour I was faced with snow fall and dangerous weather reports all over the radio. I had no snow chains, so I decided to drive up through Canberra instead of cutting across the mountains through Jindabyne. This added an extra hour to my trip, pushing my reward back further. To make matters worse, the bleak weather made a drive as the sunlight disappeared earlier than I expected. As my vision worsened, my anxiety grew. The weather reports told me things were bad. It was one of the worst late snowfalls that this area had seen for a long time. I was nervous. The sensible driver inside me was screaming at my inner speedster who wanted to finish the drive fast. I knew that slowly and safely was the only way. After a few hours I was tired and nervous yet still so far away from home. The light snowfall of this dark night marred my visibility. I had my eyes peeled but still I couldn’t see properly. I was actually getting scared because I saw several animals fleeing the area. I figured they were escaping the bad weather on the way. I started to wonder if I should be driving at all. In the next instant, almost as if to confirm my fears, I saw the shadowy form of an animal spring from the dense bushland that had been hidden by the blackness. I slammed my breaks on in terror but it was too late. I quickly realised that I had just hit a small kangaroo. It had jumped across the pathway of my new car allowing me to catch only a glimpse of its tail as it hopped away. I stopped to look for it, and to check for damage to my car. The car was dented but OK, but the kangaroo was long gone. To this day I don’t know what happened to it. I was shaken. I got back in the car and calculated how long the rest of my trip was going to take. On the map I had hours to go, but the radio told me I couldn’t turn back because of the deteriorating weather. I mustered every brave resolve and pressed on. After only ten minutes of driving, a turn of good fortune reminded me that goodness always prevails if you can hang in there long enough. From out of nowhere, an ambulance turned onto the road in front of me, and for the next hour it lead me clear of the dark snowy roads. In this one moment I was elated in gratitude as I welcomed a miraculous halo of peace and security. It was a late night arrival to my mum’s house, but I was filled with appreciation. Not only did I make it, but I had been blessed by goodness which had carried me through to enjoy a weekend with my family. I realise that this story is full of chance and coincidence, but I choose to draw encouragement from every goodness that comes across my path. Stories like this one encourage me to believe that things can always turn out well in the end. The sparkling joy on my face lasted all day. It combined my relief at making it through that horrible journey, with my deep gratitude for all good things, with the defining love I have for connecting with people that I love, with the preference I have for fun that is just a little bit edgy and irreverent. When I look at this photo I know that the darkness of that terrifying drive magnified the sweetness of my sister’s wedding day like nothing else could have. In all areas of my day to day life, I give myself completely to my belief in goodness. With all that I am, I have invested into revealing every part of the goodness in myself, which then enables me to shine a light on the goodness in everyone around me. The more I expand my capacity for freeing my own goodness, the greater my ability to effect others to the same end. When our investment is in the ongoing release of goodness, the floodgates of purity open, and its wholesome flow nourishes us all. How many of us have been to seminars and left feeling pumped … but it turns into nothing? Or have had New Years resolutions that are dead by Easter? Or set goals that are never achieved? How many of us stick motivational quotes around our house to inspire us to be bigger and better than ever before, but nothing ever changes? In our heart of hearts, we don’t really believe that we are powerful to effect or withstand change in our world. Human beings have lots of things in common with all other living creatures. We Excrete waste, we Respond to the world around us, we Grow, we Move, we Reproduce. As living things, we need nourishment to give us energy, which we get from the world around us. In our western world we get food from our fridge and water from the tap. Thank God we have moved away from hunter gatherer lifestyles! We take this energy from our world, and then we transform it inside our bodies through our metabolism, to make Power that is useful to us. This is key! For too long we have been trying to convince ourselves that our Power comes from within, but this is contradictory to our biological make up. We MAKE Power in ourselves, but we GET the energy for that process from the interactions we have with the world around us. We have been trying to manufacture Power inside ourselves all this time, but we know that it just doesn’t work! It’s time to flip this around to finally release our Infinite Self into a demonstration of Power in our lives that is completely Unstoppable. I lost my voice in 2009 after working through a sinus infection I developed while teaching. The effects of the injury sent me into a spiral of Powerlessness which lasted a total of eighteen gruelling months of isolation. I developed a very healthy depression complete with flourishing drinking habit. I was a mess, emotionally, physically, spiritually and socially. I have never felt so disempowered in my entire life. TODAY’S BEST IS TOMORROW’S BENCHMARK: If we are going to truly believe that we have the Power we need to withstand and even create change in our lives, we need to see ourselves on a pathway of genuine life improvement. This means taking on a lifestyle of constant increase. The Japanese call it Kaizen. It means we never arrive at a culminating day of ultimate glory, because there are always new heights to be pursued. It means that we never face the risk of quitting or regressing when we hit the slump that often follows the achievement. It means we get to enjoy the rewards of this one moment while taking in the panoramic views of the bright future ahead. With this approach we can take on quitting or simply reducing smoking, drinking, over-eating, or over-spending. We can overcome procrastination, over-sleeping, or workaholism. We can even make ourselves better people by putting a stop to gossip, lying, selfishness or self-doubt. Making Powerful progress in any area can only come this way. When I watch myself achieve a new level of success, I never go back to old ways of thinking, acting, talking, being. Living this way means that we never find ourselves backing down or making compromises in our life. With this approach we finally do away with the struggle we have had in realising our Power at work, in our relationships, with our spending, in our family arrangements. This mindset means we always know that this part of our life is better than it has ever been before, and it can only get better from here. NEVER BREAK A DEAL WITH YOURSELF: You will never believe you are Powerful if you watch yourself fail at commitments. Honestly, you are better to never make the commitment in the first place. The damage of breaking that promise is so much worse than never setting the goal that you don’t see through. Your self-respect is the central pillar of your Power. Once you make a promise to yourself, you must keep it if you want to know a Power that is Unstoppable. Because of the serious approach I take with making commitments, I hesitate every time. I may well be the only coach or motivator who ever suggests that you avoid setting goals. It’s not that they are not important … I just know that failing to achieve them can have a damaging and even destructive effect. Of course achieving new landmarks is important to progress, so I have developed a positive, human-friendly approach that helps to minimise the damage of possible failure. SET UP WINS, NOT GOALS: My goals function more as an expectation of the sequence of wins that I have set myself up for. I know that I will get better at being me, in an increasingly limitless expression of my Infinite Self, if I simply practice being that person in my normal day-to-day life. I grow into new wins financially by directing my spending plan towards my priorities, and I enjoy wins in my family by learning how to love in ways that are generous, healthy and sustainable. I string wins together in business by managing my time and resources strategically, and I also enjoy wins as a writer by persisting every day with being consistent and enlivened by my work. I have ideal outcomes in mind for every area of my life, but I need to remember that I can only draw energy from my smaller wins, and I transform that energy into Power inside me. I am currently working towards running a marathon, and I have even set this year as my timeframe, but I hold loosely to it all knowing that this goal, like all goals, can only be achieved on the back of wins that follow wins. We can take each of these three approaches into every area of our life to experience the Power of our Infinite Self. The attributes of self-respect, constant improvement, persistence, and celebrating wins will always offer more lasting reward than finite, limited progress in any one area, because these attributes give us the proof we need to believe that we really are Powerful. To truly come to know the Power of our Infinite Self, we need this evidence. We need to watch ourselves draw energy from our successful performance in the world, and then transform that energy into the Power we need to turn any disaster into our Next Big Chance. When Alec and I decided to finish up with Godfreys to pursue the wide open spaces of our own independent business, we faced the thrilling brand-new-start combination of excitement and terror. Alec wanted nothing more than to make his online store work for us, and I wanted to fulfil the deep hunger that I had for autonomy. We were flying high on optimistic wings of hope and opportunity, choosing to be the masters of our own fate. We were pursuing the dreams of our heart. We were chasing down our deal-breakers of happiness. In some ways I had the easy job, because I already knew that teaching was my passion, so the main part I had to play in our new business directions was simply to get busy building a steady income from the career I had already begun. And in my spare time, I got to be Alec’s lackey, doing whatever I could to help with the bigger goal of freedom. For Alec, he had some work to do. The Nelson Vacuums eBay store had shown a very promising start, but it was not turning over a sustainable amount of money. We needed to do something else pretty quickly if we were going to keep our promising ship afloat. We sat down on our bed a couple of nights later and had a big, clean slate kind of talk. The very act of piling up our cushions there was like hitting the Pause button on our life. The world had to Hold while we redefined it for ourselves. I asked the question that has become like a lantern to light my way through every dark season: “What would our perfect life look like?” For Alec, this question was a blank cheque that allowed him to imagine the daring risks he needed to take to pursue his deepest desires. More than anything else, Alec wanted a successful online business, but to do that, he would need to set up a bricks and mortar store to act as a financial bridge to that dream. With access to suppliers, contractors and warranty agents in the appliance industry already set up from Godfreys, we decided to open a small appliance repair outlet. We proudly called it That Repair Shop. We were both starry-eyed with optimism. We had visions of us growing quickly into business success that looked like a glamorous 80s episode of Lifestyles of the Rich and Famous. Granted, the visions were strangely set on the banks of the Murrumbidgee River, with the image replacing exclusive night clubs with live bands at the local pub, but still, we felt footloose and fancy free for the pursuit of big dreams. As a measure of grounding our wild aspirations, Alec did make a promise that inspired confidence and security in me. He knew we were taking a big, daring risk that would stretch us financially. To jump in, we needed to invest in a store fit out and signage, expert technical staff, and advertising. So he assured me that if That Repair Shop wasn’t making a healthy turnover we needed to cover the week to week expenses by the end of the first year, we would shut up shop, and he would find more conservative retail sales work while he continued to build his online masterpiece. This assurance was exactly what I needed to give myself completely to the plan. I was happy because it was a sensible plan that included levels of priority, the ultimate goal being the growth of the online store that would set us both up in the longer term. I loved that we were using every resource we had to build the Grand Plan. The strategy of a looser commitment to That Repair Shop, and a flexible approach with my teaching, was the opposite of a compromise. It was us throwing everything we had into the Perfect Life that existed only in our imagination at first. It was us giving ourselves solely to the autonomy and empowerment of a life that we built to suit our unique selves, from scratch, on purpose. It was us investing wholly into those things that we knew were essential to our own deep, lasting happiness. One of life’s greatest wonders is that we as humans are made for things that exist beyond our current capacity, where they can be perceived only in our imagination at first. The key to growth always, is to have a clear and precise idea of what you want. This idea needs to be so specific and so completely crystal clear, that it glistens brilliantly in front of you. It should be so dazzling to you that you are compelled to its realisation. You should be so enamoured of your imaginary idea that you simply can’t help but chase it with everything you have, because you know it is simply perfect for you. Not only does this energy never run out, it actually gets stronger when it runs into tough times, because it is fuelled by a deeper calling to a you-shaped purpose that defines you. The sort of idea I am describing is one that springs from your core, demanding to be fulfilled. When I lived in Wodonga we used to find refreshment from hot summer days at the local pool. My youngest sister Melissa used to join the kids’ dad and I for our afternoon swims, and like lots of families, we enjoyed playing games and engaged in competitions that rivalled the Olympics in our minds. One of our favourite events was underwater swimming, where the winner was the one who could swim the farthest without coming up for air. Melissa, who was 13 at the time, must have a dolphin gene that is recessive in the rest of us. Not only could she consistently beat us, but she improved at break-neck speed, swimming harder and longer and further with every new round. Her lungs were made for the task, and kept her body fuelled with the oxygen her muscles needed to push her all the way across the width of the pool. Time and time again we did not see her head until it popped up against the pool’s far wall, when she desperately sucked in a long, deep breath of much needed oxygen. Her answer had such an impact on me that it has stayed with me for the last twenty odd years. It is so simple that even the youngest child could grasp what she was thinking, yet offered such a profound metaphor of sheer grit that it has changed my life. It illustrates perfectly the sort of determination we all need to get through the seasons that threaten to drown us. The last twenty years of my life have given me ample opportunity to get better at applying this very determination. When I am sinking, and I feel like I can’t breathe, I remember that I am already able to get through to the other side of the pool . Everything I need is deep down inside me. I just need to trust that truth so much that I simply don’t come up till I get there. All of us have the ability to access greater heights of fulfilment than we experience in our life now. There are greater levels of freedom waiting for us to enjoy, but they only come if we can just push through with determination. The power of our steadfast will is the only way to activate the ideas that currently sit just on the other side of our limitations. At first, these ideas exist only in our imagination, but they are brought to life when we invest everything we have into making them real. The ideas that will change our life are the ones that are absolutely mesmerising to us because they stem from who we are in our one-of-a-kind self, so they generate their own renewable energy. They combine our strengths and attributes with the desires of our heart, and they will not be silenced. They are so much a part of us that they are as alluring as the pot of gold at the end of the rainbow, with one notable difference: it does not elude being grasped by hands that refuse to stop chasing until that golden idea is made into a transforming reality.